It's only been two weeks since I'll Have Another came on late to take the Kentucky Derby, and now he'll have a chance to keep the Triple Crown dream alive at the Preakness Stakes on Saturday. 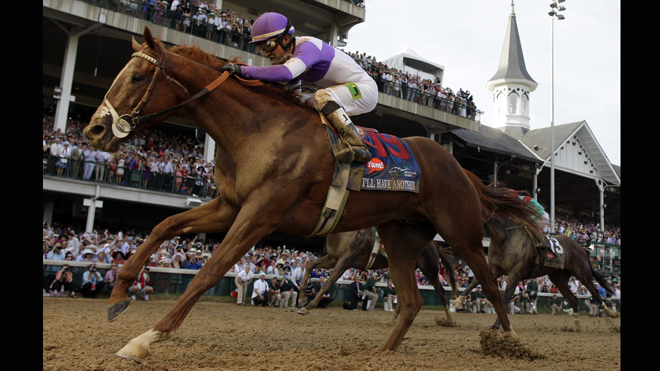 It's been four years since we've had a horse take the first two legs of the Triple Crown (Big Brown in 2008). Prior to that, it seemed to have happened much more regularly, as 1997-1999 and 2002-2004 all had horses with a chance to capture the Triple Crown (but ultimately failed) in the Belmont. Maybe this means we're due for another Triple Crown Contender this year. 1) Bodemeister is for real - some questioned whether Bodemeister was for real since he never raced as a 2-year old, but I think he silenced all doubters in the Derby. The pace for the early half of the race was blistering, and I think most felt Bodemeister would fail miserably down the stretch. Instead, Bodemeiester held strong and almost took the win wire-to-wire. 2) I'll Have Another is for real too - at least I had I'll Have Another among my "Maybes" picks for the Derby, unlike last year when all of the Triple Crown winners ended up being among my "Stay Away" picks. I'll Have Another had two major negatives against him before the race - starting from the 19th post and having a seemingly inexperienced jockey. Mario Gutierrez certainly showed that he is ready for the big leagues as he guided I'll Have Another perfectly to become the first winner from the 19th post position. 3) Missing in Action - A few of the Derby horses who I hoped would run again in the Preakness (Alpha and Dullahan in particular) are skipping the race instead, but hopefully they'll be back for the Belmont. Profit!! Too bad I didn't actually bet, boooo.